The Nineties were the golden age of independent music. Not only did Americans show us that you can become really rich and tragic when you just shout out your anguish loud enough, also Germany was working intensely on its own version of melancholic indie rock. The two most notorious examples are Sharon Stoned and The Notwist, but actually there were hordes of promising newcomer bands just waiting to be discovered. One of them were Chromosome 86 from the Eastern regions of Germany, who released a much observed 7"-EP on Noiseworks Records, a release that found its way even to Luxembourg where it got some airplay on Radio ARA. Nearly a decade later, Chromosome 86 are no more. 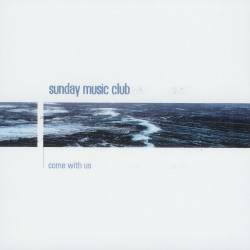 The members have founded the Sunday Music Club, which is the logical development into the new millennium. Stating on their website that they don't want to sound like a hyped band from the States or the Isles, they still do what they can do best: understated indie rock with gently distorted guitars and a smoothly programmed beatbox. SMC were influenced by the shoegazer movement, and although the melancholy of that genre is omnipresent in their songs, they never fall into languid self-pity. Come With Us is an EP, and as such is convincing with five good songs that live off the balance act between indie pop and gentle noise. Apart from the last song which is more danceable, we're left with four gems of sad but beautiful pop music. On the band's website you can download their entire debut album and one song from the EP which is sold for a very low price at the Finetunes MP3 music shop. Come With Us, while never innovating the genre, is never a record you would regret to have bought, as it combines all that was good but often unlooked at in the Nineties with a more song oriented approach of a more modern time.